Back in the early days, men used a sundial to tell the time of the day, relying on just how far the shadow has fallen. However, technological advancements and an inquisitive mind has seen time telling transform to use hands, and the analog clock was soon challenged by the digital format. 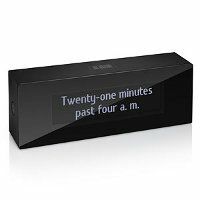 However, with the $189.99 Verbarius Digitless Clock, the name says it all – it will not contain any digits, and neither will it tell the time in a traditional manner of using two hands. Instead, it will verbalize the current time, just like how you and I answer someone when asked for the time. I guess this is the ideal device to pick up the time in a new language, as you can choose from five preloaded languages – English, German, Spanish, French and Russian, with the option to download a dozen other languages according to the instructions given in the box. It is powered by a 110/220v power source, and thankfully there is a backup battery in the event of a power failure.